New York Fashion Week has begun its first season in Skylight Studios at Moynihan Station in the 34th Street District. 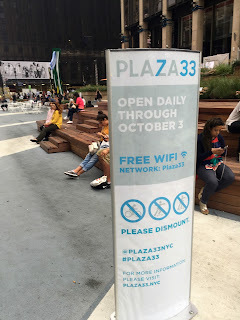 To celebrate, we are featuring eats, drinks, and outdoor lounges (one with free wifi) in high-heeled walking distance (one block or less) to Moynihan. Starbucks: South side of 34th Street between Seventh and Eighth Avenue. Free wifi. Roastown Coffee: 34th Street and Eighth Avenue, NE corner. Free wifi. Also, decent sushi for take-out or dining in. 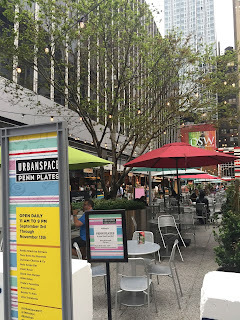 Penn Plates: Pop-up food market at One Penn Plaza Park East, between 33rd Street and 34th Street in the plaza just west of Seventh Avenue. Great selection from oven-fresh pizza to paella and arepas. Farley Post Office steps: Sit and be seen on one of New York City's most dramatic entrances, the steps leading up to the Farley Post Office. 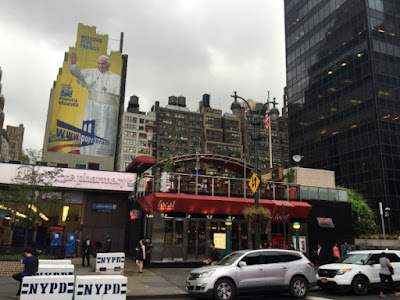 Right around the corner from #nyfw on Eighth Avenue between 31st and 33rd Streets.